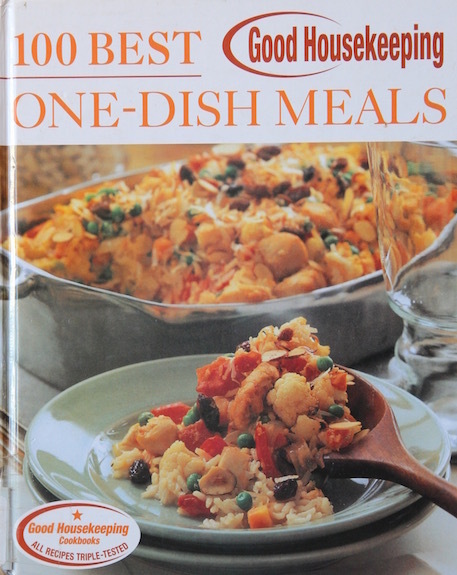 Good Housekeeping: 100 best one-dish meals, 152pp. One-dish meals are a great time-saver in the kitchen. So easy to chuck everything into one pot and much less cleanup afterwards. I checked this out of the local library for some inspiration as winter approaches in Australia. This has lots of great options, including a winner on pages 32–33. Cut the roots and trim leaf ends of leeks; cut each leek lengthwise in half and separate leaves. Since well with cold running water to remove any sand. Cut leeks crosswise into 3/4-inch pieces. Cut root end and stalks from fennel bulb; discard. Cut the fennel bulb lengthwise into thin wedges. In a 5-quart Dutch oven saucepot, heat 1 tablespoon olive oil over medium-high heat until hot. Add 1 tablespoon butter; melt. Add chicken and cook until chicken is golden and just loses its pink color throughout. With slotted spoon, transfer chicken to medium bowl. 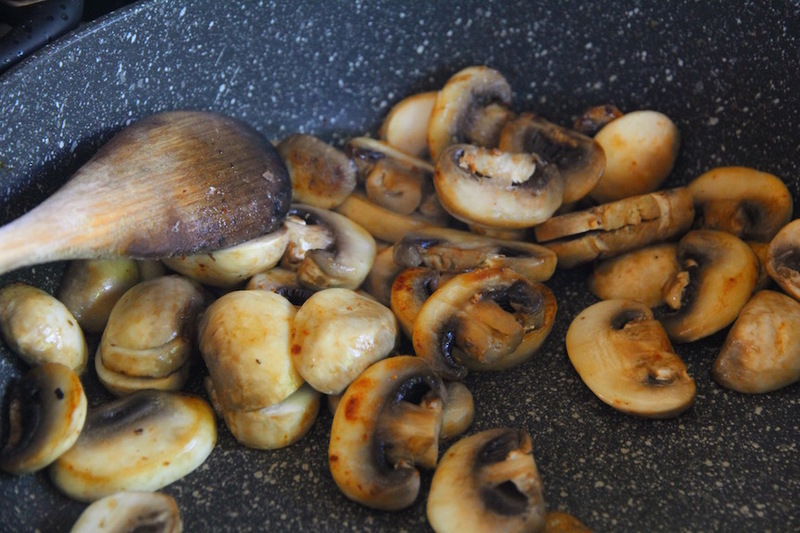 To drippings in Dutch oven, add mushrooms and cook, stirring often, until golden (do not overcook). 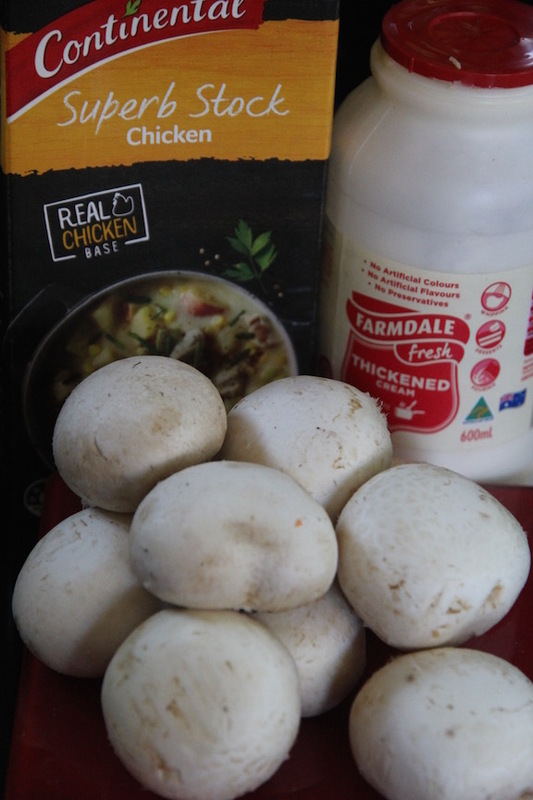 Transfer mushrooms to bowl with chicken. To Dutch oven, add remaining 1 tablespoon of olive oil; heat until hot. Add remaining 1 tablespoon butter or margarine; melt. 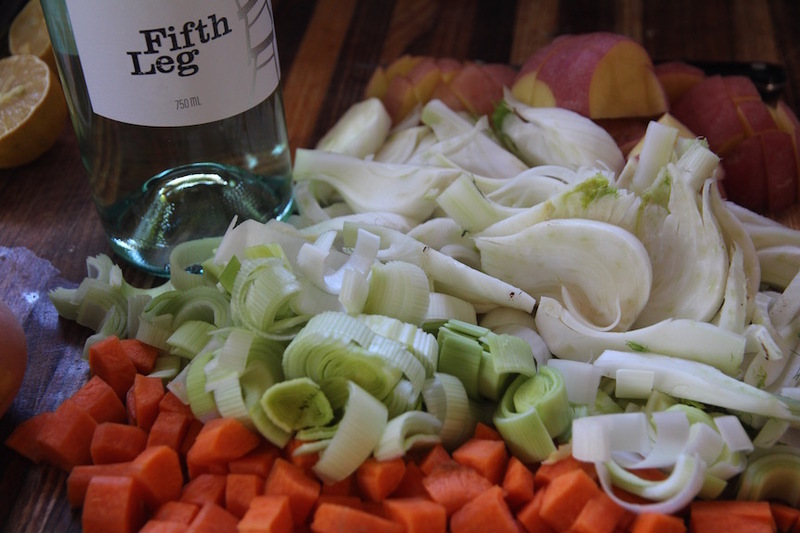 Add carrots, leeks, fennel, potatoes, bay leaf and tarragon. 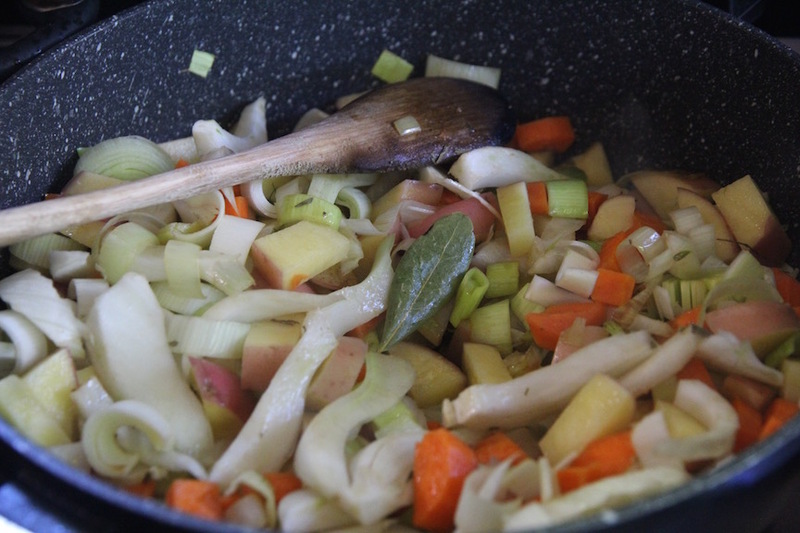 Cook vegetables 10 to 15 minutes, until fennel is transparent and leeks are wilted, stirring occasionally. Add wine; cook 2 minutes, stirring. Add chicken broth and water; heat to boiling over high heat. Reduce heat to low; cover and simmer 20 minutes or until vegetables are tender. In cup, mix half-and-half and flour until smooth. Stir half-and-half mixture into vegetable mixture; heat to boiling over high heat. Reduce heat to medium; cook 1 minute to thicken slightly. Stir in chicken, mushrooms, peas and salt; heat through. Discard bay leaf. Serves 4. 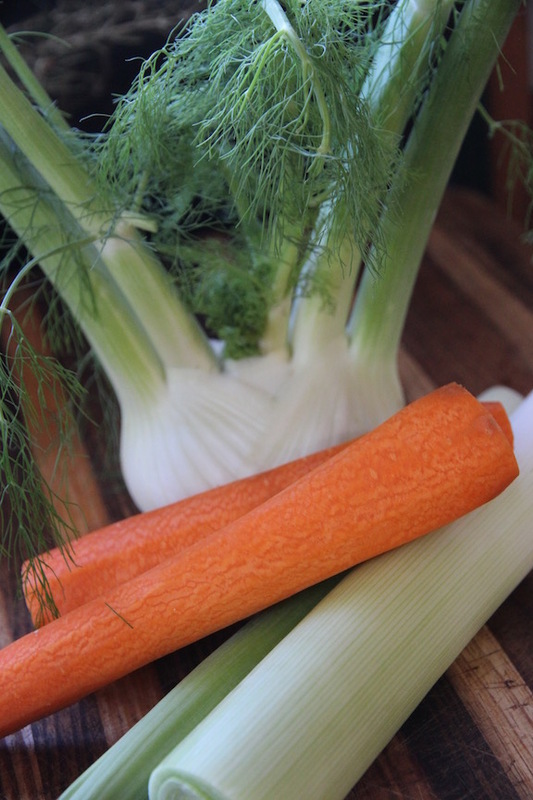 Except for the fennel, these are the kind of ingredients I have on hand almost year round, so I was ready to go as soon as I bought the fennel. It didn’t take long to chop all the vegetables and get underway with the cooking. I then followed all the cooking steps until—YES UNTIL—it came time to serve. I had a lovely bowl of stew all served up and was in the midst of photographing it when Poor John said, ‘Aren’t there supposed to be peas in the stew?’ Oh ugh, yet again I managed to leave out an essential ingredient. Not to worry, the peas were thawed and ready to be added. So I dumped them in, rewarmed the stew, and started a new photography session, complete with peas. This stew is delicious and so easy to make. It shouldn’t be too hard to modify the recipe for someone who is gluten and/or lactose intolerant. Potato starch or cornstarch (cornflour) could be substituted for flour and there are lactose-free options for the cream. I think it would also work well in a slow cooker. P.S. The photo below is before adding the peas. 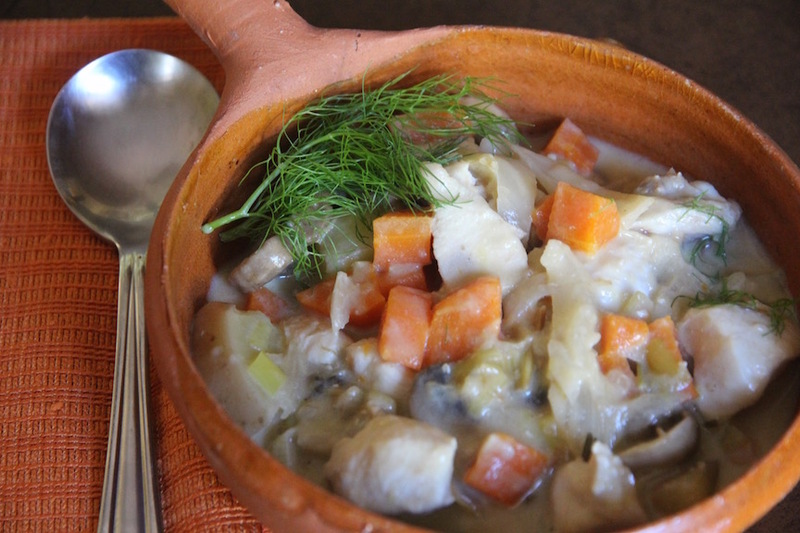 This entry was posted in Main dish, Stew/soup, Vegetable and tagged butter, carrots, chicken, chicken broth, cream, fennel, flour, leeks, mushrooms, peas, potatoes, tarragon, white wine. Bookmark the permalink. Thanks. I’m travelling in national parks at the moment, but will check in when I have better connections. My kind of meal – I can actually make soup and stew. I wouldn’t have thought of adding cream as usually my soups thicken because of the potatoes. Do you think the flavor is greatly enhanced by the cream? But – I would never insult a nice pot of soup with peas! The cream is nice, but certainly could be left out, especially if an eater had lactose issues. I love peas, but confess that I didn’t taste the before and after versions. My oldest daughter would have just picked out the peas anyway. LOL! It looks like an amazing, hearty stew.